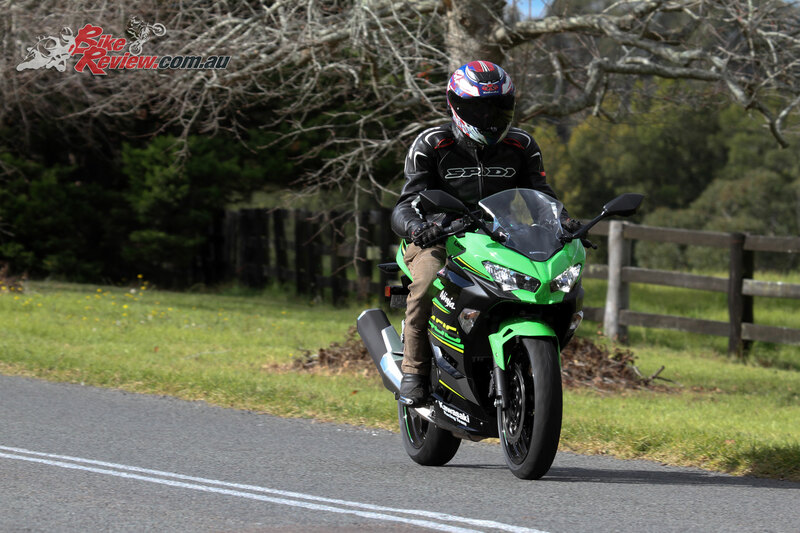 One of the most exciting new additions to the LAMS category in 2018 is no doubt the new Ninja 400, replacing and surpassing the Ninja 300, which is a bit long in the tooth, if still a great beginner’s choice. The 300 truly ruled the roost when introduced, but everyone else took notice and competition has been exceptionally fierce. 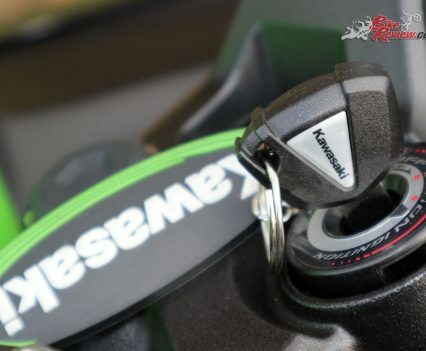 Now Kawasaki have returned fire updating this mid-capacity LAMS machine, and it has instantly proven a dominant force in the World Supersport 300 championship. For the vast majority of users though, the real question is how this delivers as a road machine, as that’s where you’ll be spending your time. 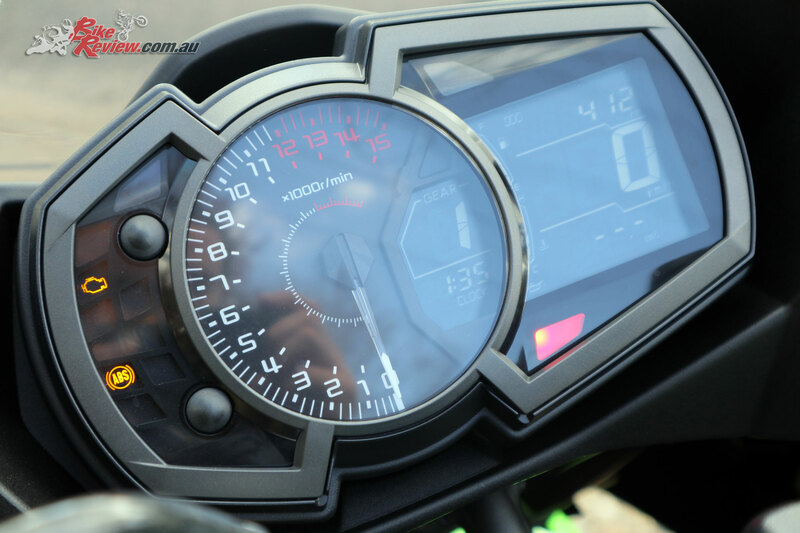 You can also check out our earlier Ninja 400 Track Launch Report by Simon Harris here, if you’re interested in the track perspective. 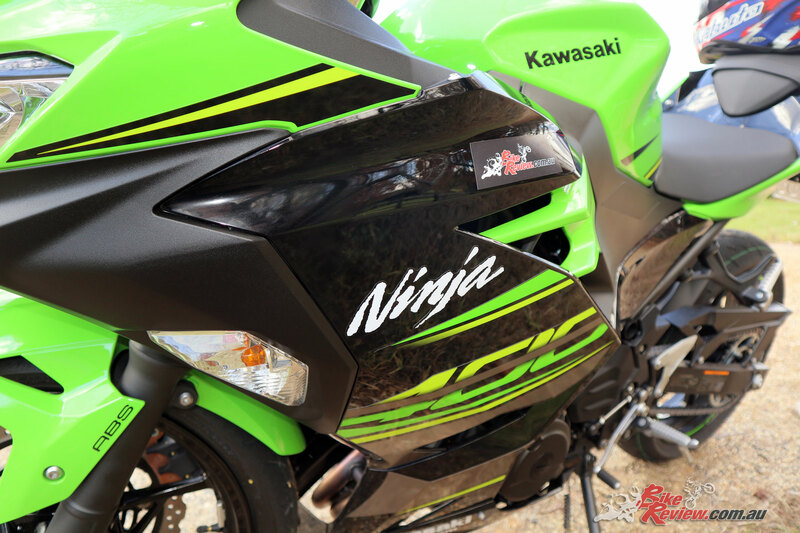 As a quick refresher, the Ninja 400 gained almost 6hp on the 300, with a healthy boost of mid-range torque, while weight is down to 168kg (fully fueled) according to Kawasaki. 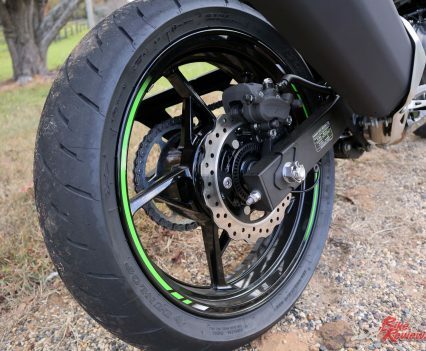 Forks are upgraded 41mm units and it looks to me like they’ve come off last year’s updated Ninja 650, alongside the braking package, with a slightly larger rotor at 310mm. 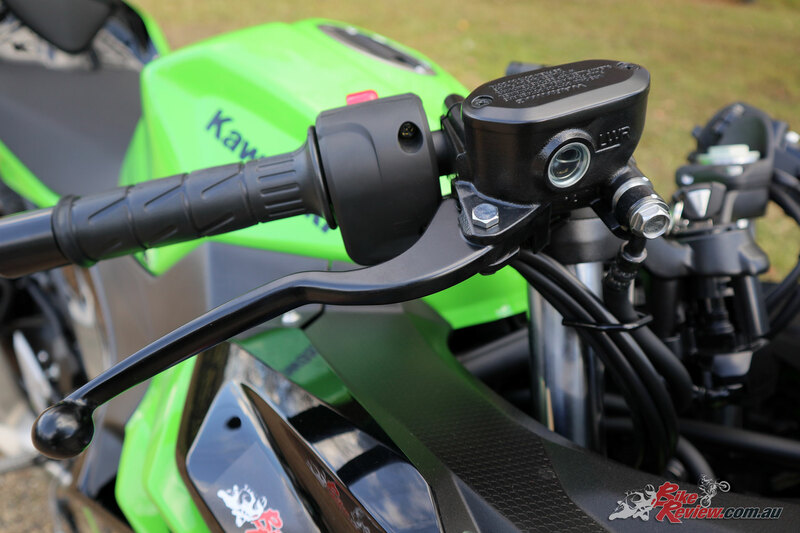 A good inclusion in my mind is the slip and assist clutch, featuring a new more compact clutch and less rigid plates, which contribute to the light lever feel. 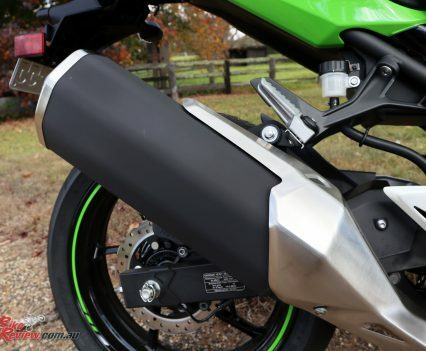 Fueling is also further improved over the outgoing 300, while other quality of life improvements include retaining the only 785mm seat height, but narrowing the bike, making for an easier reach to the ground for all riders. If I’m totally honest it looks like they’ve really made the new Ninja 400 tough competition for the Ninja 650, which does offer significantly more torque and the bigger bike feel, but at a more premium price. 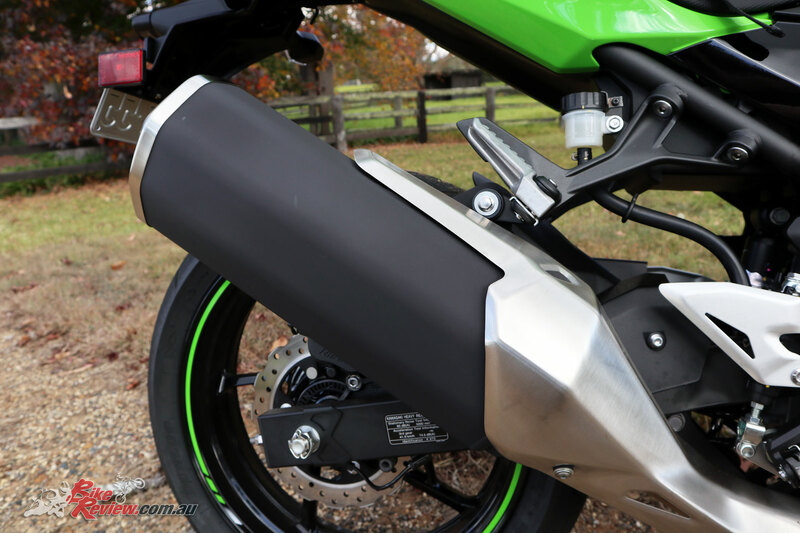 The two side by side are hard to tell apart, while the 400 could at a glance pass for the 6R or 10R, depending how familiar you are with motorcycles. 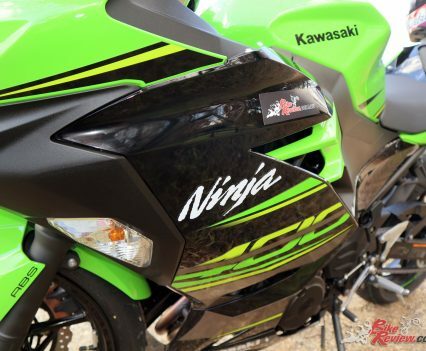 On the bright side, the Ninja 400 is right at the forefront of competition in its category once again, even if the 650 may suffer as a result. 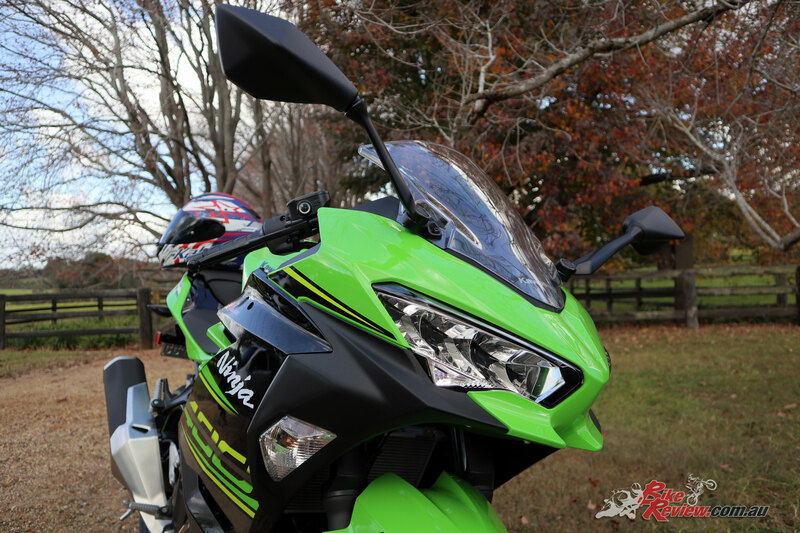 Jumping on board, the Ninja 400 feels light and racy, with an upright seating position, good vision through the mirrors and simple but easy to use switchblocks. It’s easy to flick those indicators on and off, the start and kill switch work effortlessly, and there’s no cheap looking or feeling components. 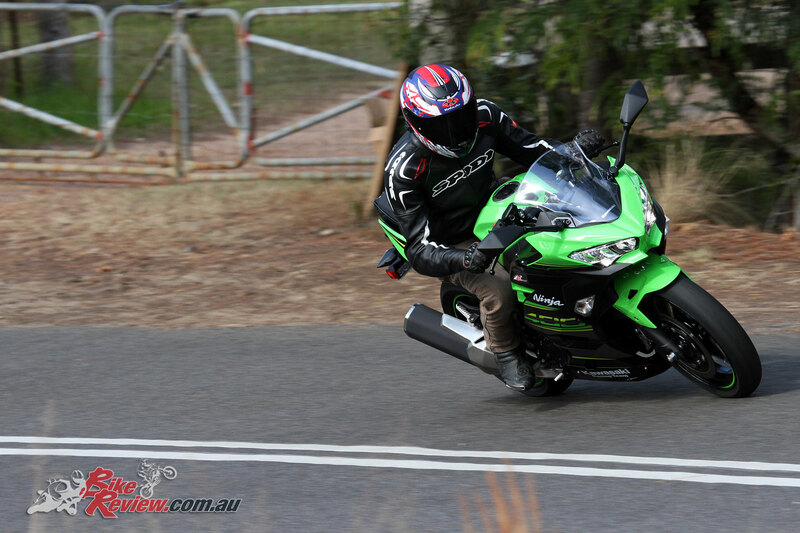 In fact finish quality is exceptional, I’d be super happy owning one of these machines, especially in the KRT colours. 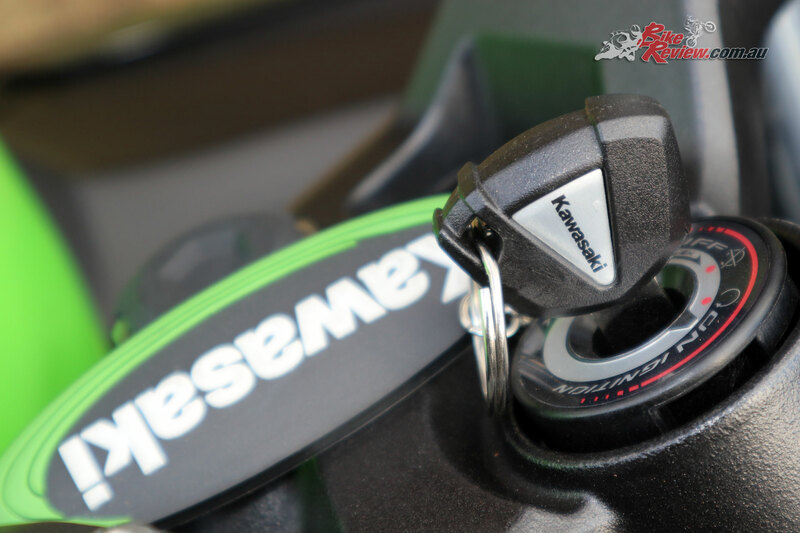 The clutch is also incredibly light, like feather light, with a super smooth gearbox, and a very natural transition onto power as you feather the clutch. The seat to ‘bars to ‘pegs triangle is just about right for me too, it’s not cramped, but I’m also not stretching for anything while seated naturally, while I’ve got plenty of room to push back down the seat. When it comes to having more of a fang, it’s also easy to grip the bike between my knees, with no bodywork or similar digging in. 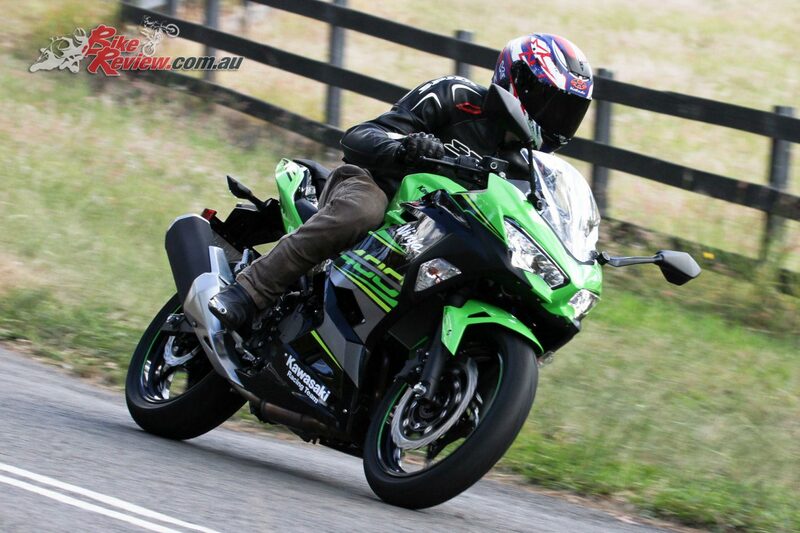 My first ride was a commute through Sydney, in heavy but not peak hour traffic, with the Ninja happily dealing with being stuck in the congestion as far as heat and crawling along at low speeds, with great stability at microscopic speeds. Where possible (and safe) lane splitting was also easy with the bike nice and narrow, even with the mirrors, while that stability, great fueling and light clutch all ensure confidence in the tight spaces. Power delivery for the road is ideal, with a nice linear bottom end that evolves into a much punchier mid-range and just keeps pulling right up through the rev range, giving that real boy racer feeling. Staying below 6000rpm in traffic or around town lets you enjoy that more relaxed power delivery, and is very forgiving for newer riders. Being a gear or even two too high won’t have the engine lugging, and you can actually take off from second gear, just an example of how flexible the powerplant is. 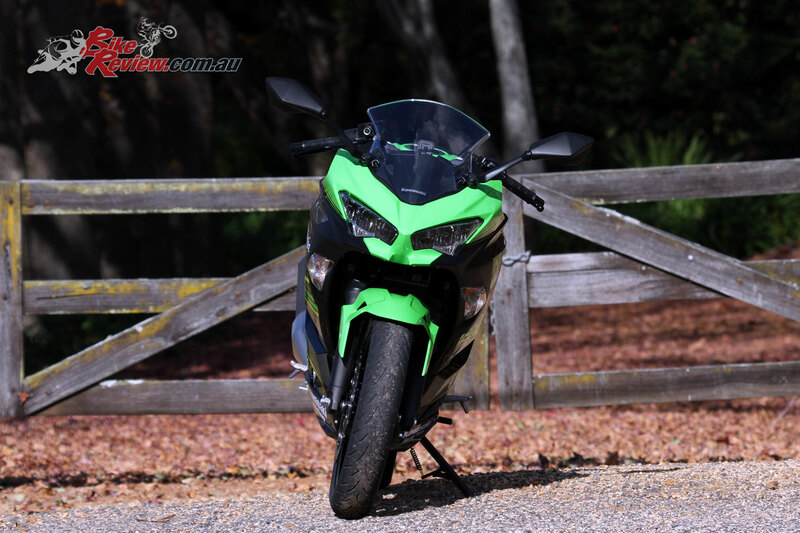 Taking off quickly is just a matter of aggressively accelerating and the parallel twin spins up quickly, with the option to upshift early in that mid-range or really rev the bike out a bit more to reach that top end. Around town I was sticking to that mid-range when I had some clear roads, while out on the open road it was a bit more viable to properly explore the full rev range in the higher gears. There are a few points at which closing the throttle, or transitioning back onto power can be a little choppy, but they are few and far between, and my criticism of the 300 exhibiting this same problem but much more commonly is addressed on the new model. 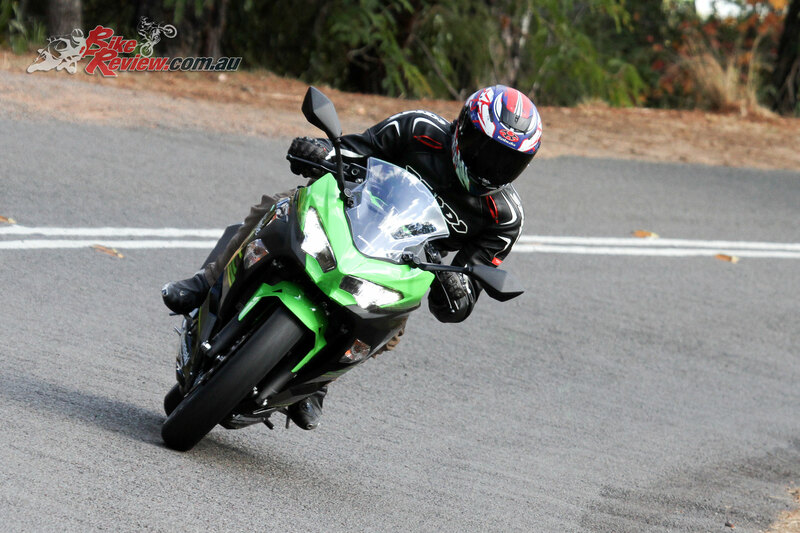 Getting into the twisties and dropping it down a gear or two instantly rewards with a compelling and fun ride, this is no supersport 600cc material, but honestly the Ninja 400 is capable of reaching the speeds where you’ll be handing over your license for a lengthy period if you get caught. It’s also far more fun playing around at less license threatening speeds, giving the rider a real opportunity to properly make the most of what’s on offer. 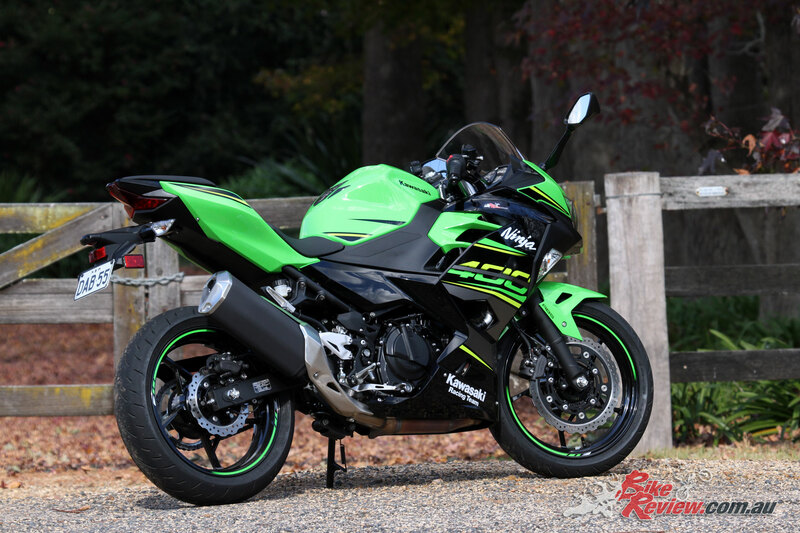 Compare this to the much older four-cylinders that were popular 12+ years back when I first started riding and the Ninja 400 puts them in the dust. Suspension is significantly better, the rear is a bit stiff for me, but I’ll play around with the preload adjustment, while the front end is very well sorted. 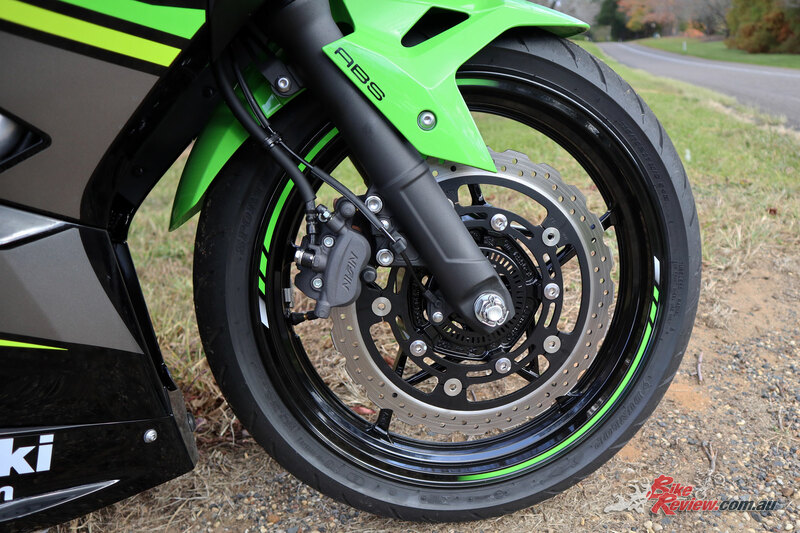 That single 310mm rotor and two-piston caliper is basic, but with the light bike actually offer good stopping power. 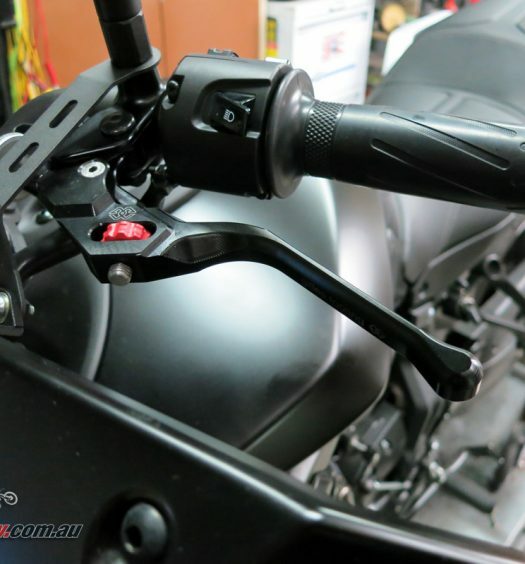 It does not provide as much bite as the RC 390 four-piston caliper setup for example, however it’s a little more balanced and beginner friendly. 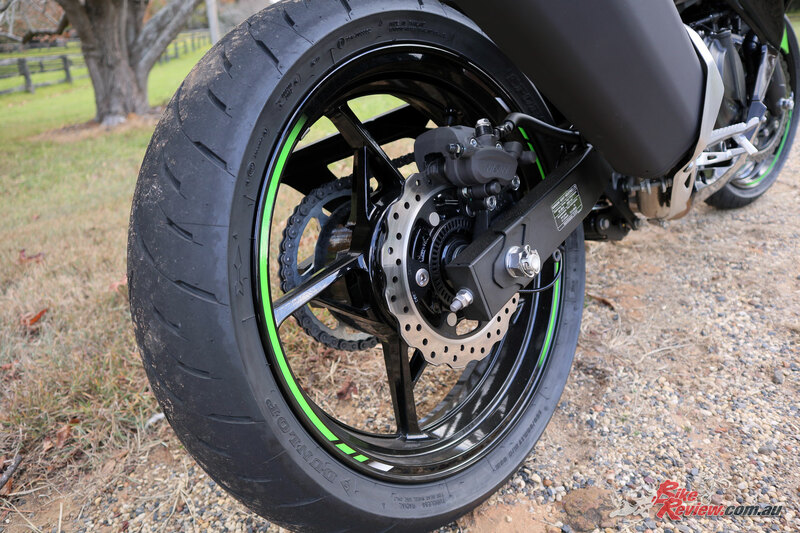 I haven’t had a chance to properly test out the ABS by deliberately testing the limits of traction on the standard tyres, but I’ve been impressed with the brake and tyre performance thus far, including in the wet, which is always good on a LAMS legal machine at a competitive price. There’s no early ABS brake activation, which can be particularly noticeable on the rear, and there’s great overall feel from the tyres. 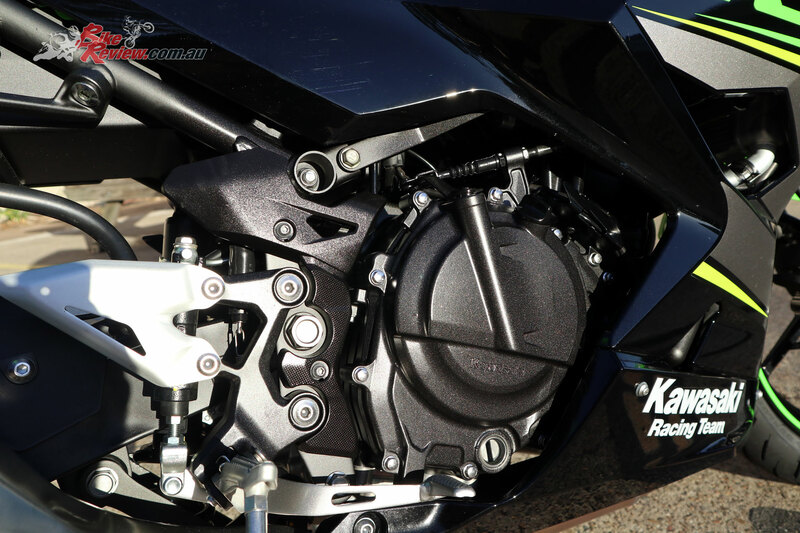 The Ninja 400 is also extremely flickable, with easy line corrections, and neutral handling, adopting a wheelbase to swingarm ratio more commonly found on supersport machines, meaning new riders are more easily able to adjust their line through corners, or avoid hazards. Even the turning circle is nice and tight, with good low speed stability, so passing those U-turn tests will be as easy as it gets. Other notes? 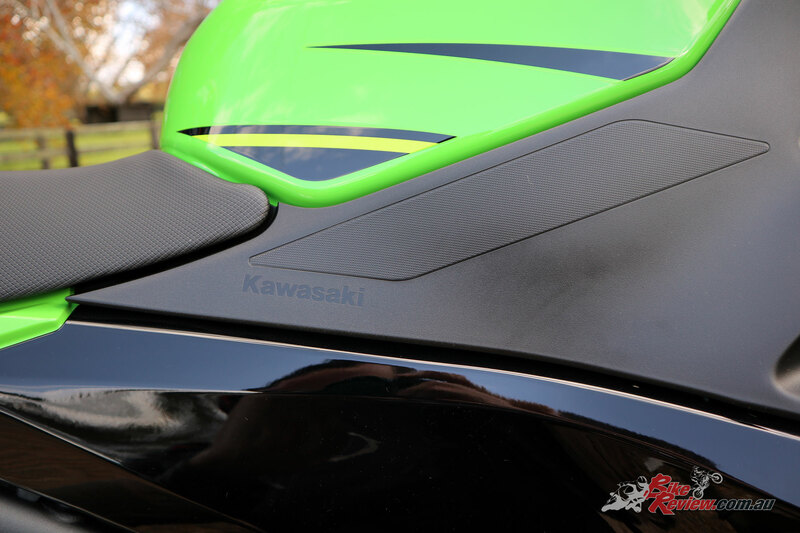 The front fairing features the chin spoilers which are cool. The dash is simple and exactly what I hope for, indicator lights are top of the dash, so hard to miss when you forget you’ve left them on. 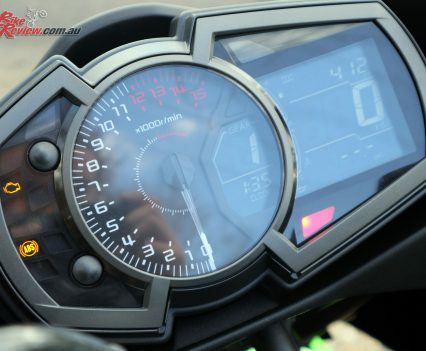 There’s a fuel gauge, gear indicator, clock and trip meter. 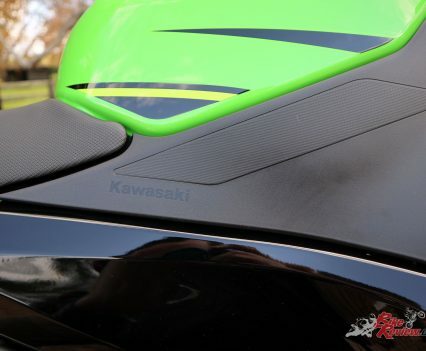 The Kawasaki ECO light is also there, but less prominent. It just tells you when you’re taking it too easy! Some criticisms… Levers aren’t adjustable, there’s a little distortion on the very edges of the mirrors, headlights are good, but I’ve going to see if I can adjust them up a tiny bit since I’m commuting home in the pitch dark now, and through the twisties a little more light throw would be good. 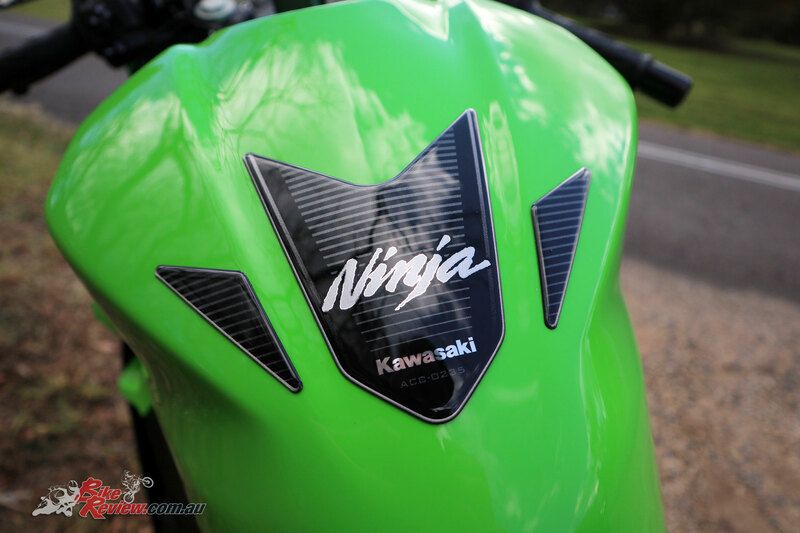 We’ve actually got the 2018 Ninja 400 as a long termer until the end of the year, so we’ll be doing a longer term test report, as well as heaps of coverage as far as servicing, maintenance, modifications and plenty more. We’ll also be covering the experiences of a long time scooter rider switching to a real motorcycle, so stay tuned. 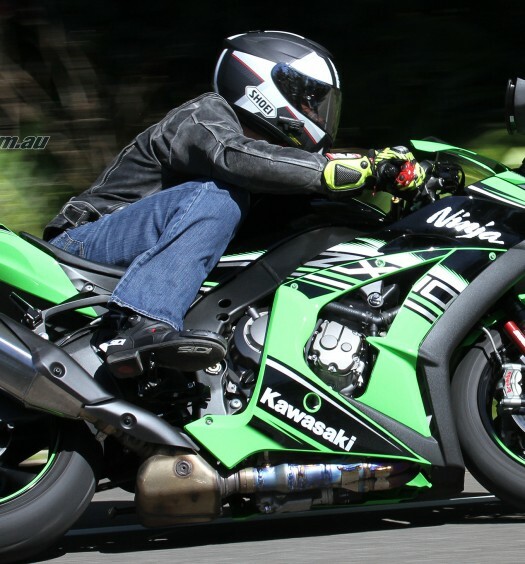 I have a soft spot for the Kawasaki Ninja 300, having helped fill the final shelf in my trophy cabinet with some F.O.B and Outright wins or podiums in the Ninja Cup a few years ago. 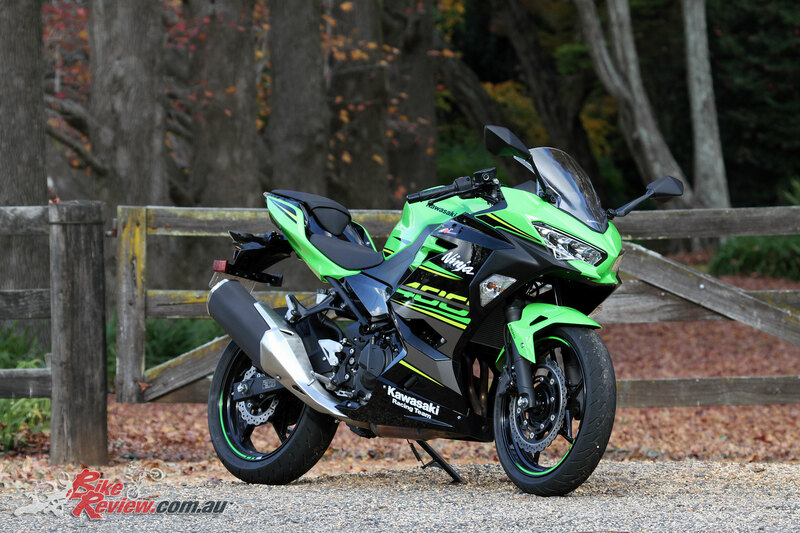 As a rider who grew up on two-stroke 250s in my learner permit days, I always struggle to find the current generation four-stroke small capacity four-strokes exciting but the Ninja 400 has changed that. To say the 400 is an improvement over the 300 in almost every way is a fair statement. The bike feels bigger but lighter, is more stylish and the engine is really fantastic for a 400cc twin-cylinder four-banger. 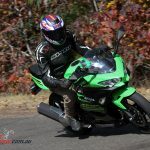 I spent some time on the bike up on some open country roads around the Hunter Valley and having a fang on some local twisties and was impressed. The engine is eager from the bottom, with plenty of torque now where the 300 was asthmatic. 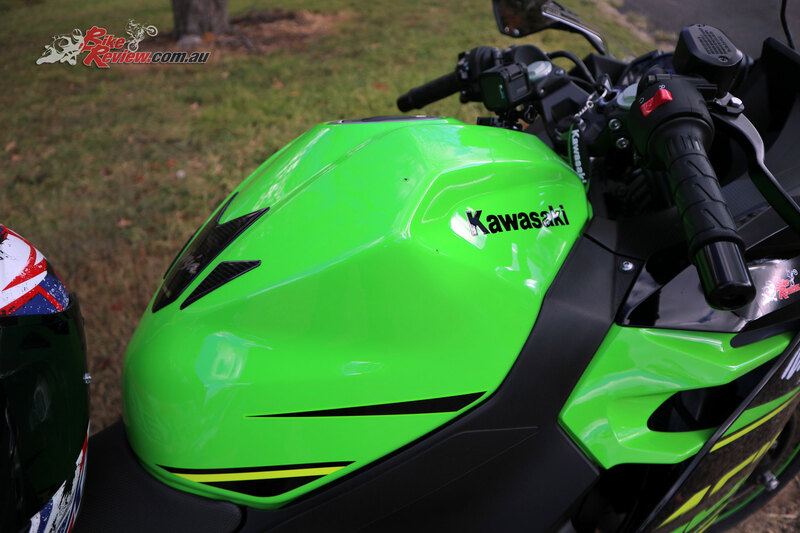 Once revving, there is a fun top-end, making the 400 feel sporty and exciting. 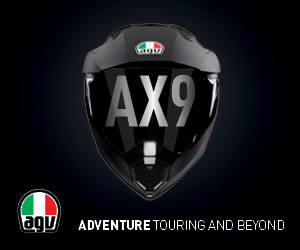 Handling is brilliant, with high corner speeds giving a thrilling experience, while stability is still rock solid. Thanks to stable geometry, a long wheelbase yet narrow tyres and light weight, plus wide ‘bars, flicking the 400 around is easy and accurate. It is a confidence-inspiring little ride and does everything well. 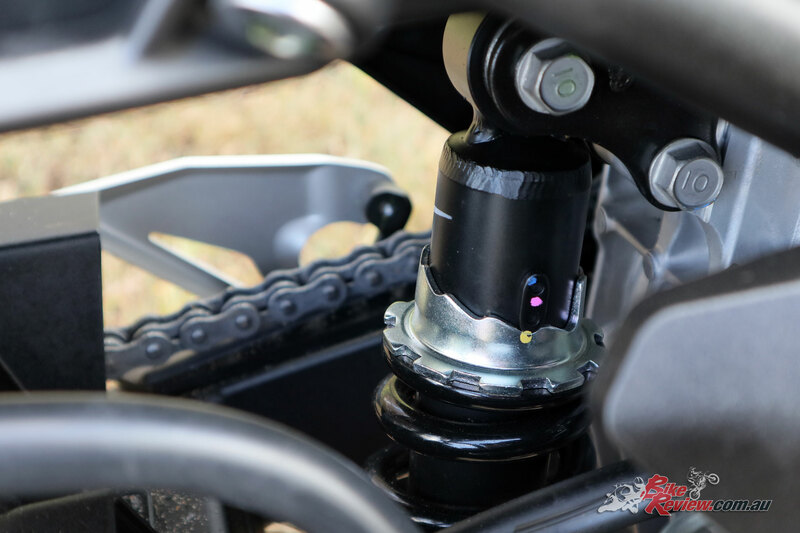 The only change I would have liked would be stronger front brakes as the single rotor, although larger, is still slightly lacking once sports riding is underway. Overall though, a winner and if you don’t follow WSS 300, get a wsbk.com subscription and start, as it is great racing and currently Ana Carrasco is leading the championship on a Ninja 400! 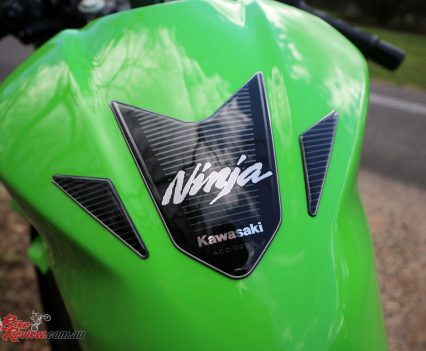 We have our long term Ninja 400 now and I can’t wait to spend some more time on the bike. 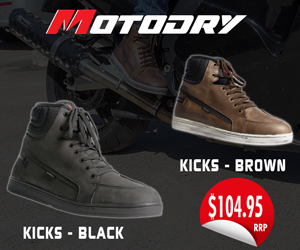 We will change to a softer front brake pad and see what that does to improve brake bite… Jeff. 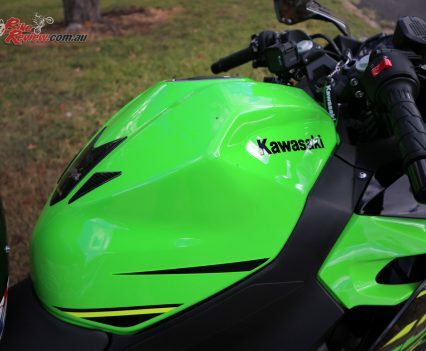 Kawasaki’s Ninja 400 improves on the outgoing 300, with more power, more torque, all new styling, upgrade suspension, upgraded brakes, and even sheds some weight, and really is a big step up from the old model, while still incorporating the easy-going ergonomics, and beginner friendly characteristics that make for a great LAMS machine.